The United States Congress designated the Upper Buffalo Wilderness (map) in 1975 and it now has a total of 11,978 acres. All of this wilderness is located in Arkansas and is managed by the Forest Service. Here you'll be among the headwaters of the extraordinarily pretty Buffalo National River, which flows down the center of this Wilderness through a rough forested land of steep slopes that descend into deep valleys. People once made their homes down in the valleys, but the last resident moved out in 1948. However, you'll see their old homes, stone fences surrounding pastures, antiquated farm equipment, worn-out roads, and silent cemeteries. 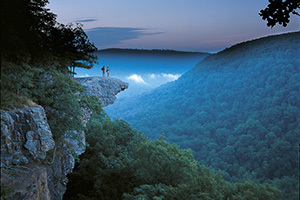 The area offers a measure of wildness and solitude not often found in Arkansas. The interior of the Upper Buffalo is so remote the quality of its rich water supply, in runs and runnels and rivulets, is classified as excellent. (No matter how clear the water looks, you would be wise to purify it before drinking.) Squirrels are everywhere in the Upper Buffalo, and squirrel hunters report their success runs from good to superior, perhaps better than anywhere else in the southern United States. White-tailed deer, wild turkeys, and black bears are the largest resident species, with a fair number of smaller animals including foxes, raccoons, minks, beavers, skunks, opossums, bobcats, and woodchucks. White oaks, red oaks, and hickory populate the forest. The summer climate is known to be hot and humid. A few people choose to visit the Upper Buffalo in winter when January temperatures may drop below zero. During the cold months, ice encrusts a number of small waterfalls and hangs in frozen drips from overhangs, and a cold peace settles on the land. No matter what the season, you'll have to find your way through the area without the assistance of maintained trails. Planning to Visit the Upper Buffalo Wilderness? How to follow the seven standard Leave No Trace principles differs in different parts of the country (desert vs. Rocky Mountains). Click on any of the principles listed below to learn more about how they apply in the Upper Buffalo Wilderness.